President Francois Hollande on Saturday promised a “merciless” response to a wave of attacks by gunmen and bombers in Paris on Friday. Latest updates indicate129 dead and 352 injured, with 99 in critical condition. Four gunmen slaughtered at least 87 young people at a rock concert being held at the Bataclan concert hall. Dozens of survivors were rescued, and bodies were still being recovered on Saturday morning. The Christian Post notes 40 more people were killed in five other attacks in the Paris region, including an apparent double suicide bombing outside the Stade de France national stadium, where Hollande and the German foreign minister were watching a soccer game between France and Germany. It is now known a suicide bomber wearing an explosive vest was blocked from enteringthe Stade de France soccer venue. In the aftermath of the coordinated attacks, reports are emerging that one of the terrorists was a Syrian refugee who arrived in Greece just last month. One of suicide bombers outside the Stade de France had a Syrian passport on his body. Greek journalist Yannis Koutsomitis tweeted the country’s Ministry of Public Order and Citizen Protection has confirmed that the terrorist was “registered as refugee on Leros island in October.” Police declined to give the terrorist’s name. Numerous experts have warned “that rolling out the red carpet to migrants from the Middle East would substantially heighten the risk of terrorists being able to cross into Europe, although such concerns were dismissed by many at the time as fearmongering,” noted InfoWars. The Guardian reports security analyst Charlie Winter said he has seen huge amounts of ISIS propaganda and he believes the statement is definitely from the group, though it was “put together hastily” and it is not clear whether the attacks that killed 127 people were directly ordered by ISIS or only inspired by the group. European pushback against migration is increasing. Hollande’s promised “merciless” response may not be enough for his angry fellow citizens. Polls have indicated Le Pen’s past strong speeches against immigration are helping her campaign in the 2017 presidential race, reported Reuters. Prior to the attack, she was considered likely to win regional elections in northern France in December and to make it to the second round afterwards, although not winning the run-off. It remains to be seen if the Paris massacre boosts her support further. “It is absolutely necessary that France regains control of its borders,” she said – a message likely to resonate with French voters worried over the recent massive influx of Muslim migrants. In a little-noticed story from a German newspaper, Bavaria’s state premier Horst Seehofer told a party conference there was “reason to believe” that a 51-year-old man arrested last week with several weapons in southern Germany was linked to the Paris attack. The article reports Seehofer explicitly linked the arrest to the refugee crisis, saying it “shows how important it is for us to have some clarity on who is in our country and who is travelling through our country.” He reiterated his call for reinforced controls at Europe’s external borders as well as at each European country’s national border. Poland’s future minister for European affairs said his government will not accept EU-mandated quotas for refugees following the terrorist attacks in France. Upwards of 50,000 Poles protested on Wednesday against the European Union and unfettered migration. Even Sweden is saying “enough” to migrants and began imposing border controls on Thursday. A line of at least 20 police officers is being permanently present on the platform of the Hyllie train station, meeting every train which comes over the Oresund bridge from Denmark. Meanwhile a high-speed train undergoing a test run in northeast France derailed on Saturday. The train burst into flames and split apart before plunging into the Marne au Rhin canal, killing at least seven people and gravely injuring 11. A spokeswoman said there were no immediate indications the crash had anything to do with the Paris attacks the day before. In England, a terminal at Gatwick Airport was evacuated “for the protection of the public” this morning after a gun was found. 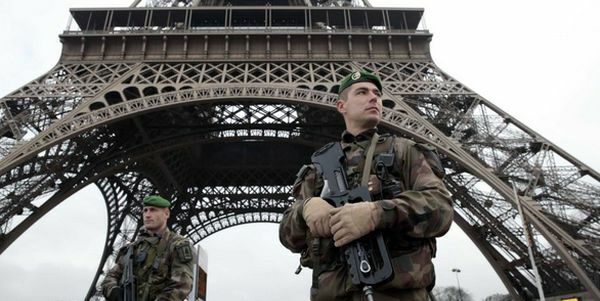 Police confirmed a man from France was being questioned. He was described as “landside” at the airport and “had not checked in or passed through any passport or security checks.” He was seen acting suspiciously before throwing a package in a garbage can. England has upped security in the wake of the Paris attacks. “The police have stepped up their security measures on a precautionary basis and UK border force are working with their French counterparts in light of the tighter border controls in France,” a spokesman said. At least two Americans are among those injured in the Paris attacks. Cal State Long Beach is reporting a 20-year-old design student named Nohemi Gonzalez was among those killed. Yet on Friday, the Obama administration moved to increase and accelerate the number of Syrian refugees who might be admitted into the United States by opening new screening outposts in Iraq and Lebanon.